The South Island (Māori: Te Wai Pounamu) is the larger of the two major islands of New Zealand, the other being the more populous North Island. The South Island is often called "The Mainland". Today this expression is used humorously, although still with pride by "Mainlanders", since while it is a somewhat larger landmass than the North Island. Only about a quarter of New Zealand's four million inhabitants live in the South Island. However, in the early stages of European (Pākehā) settlement of the country, the South Island was pre-eminent, with the majority of the European population and wealth focused there due to gold rushes. It was not until the early 20th century that the North Island population overtook the South, with 56% of the population living in the North in 1911. Early inhabitants of the South Island were the Waitaha. They were largely absorbed via marriage and conquest by the Kāti Mamoe in the 1500s. Ngāti Mamoe were in turn largely absorbed via marriage and conquest by the Ngāi Tahu who migrated south in the seventeenth century. While today there is no distinct Ngāti Mamoe organisation, many Ngāi Tahu have Ngāti Mamoe links in their whakapapa and, especially in the far south of the island. Around the same time a group of Māori migrated to Rekohu (the Chatham Islands), where, by adapting to the local climate and the availability of resources, they developed a culture known as Moriori — related to but distinct from Māori culture in mainland New Zealand. A notable feature of the Moriori culture, an emphasis on pacifism, proved disadvantageous when Māori warriors arrived in the 1830s aboard a chartered European ship. The first Europeans known to reach the South Island were the crew of Dutch explorer Abel Tasman who arrived in his ships Heemskerck and Zeehaen. Tasman anchored in Golden Bay, at the northern end of the island, (he named it Murderers Bay) in December 1642 and sailed northward to Tonga following a clash with local Māori. Tasman sketched sections of the two main islands' west coasts. Tasman called them Staten Landt, after the States-General of the Netherlands, and that name appeared on his first maps of the country. Dutch cartographers changed the name to Nova Zeelandia in Latin, from Nieuw Zeeland, after the Dutch province of Zeeland. It was subsequently Anglicised as New Zealand by British naval captain James Cook of HM Bark Endeavour who visited the islands more than 100 years after Tasman during (1769–1770). In the early 18th century, Ngāi Tahu a Māori tribe who originated on the east coast of the North Island began migrating to the northern part of the South Island. There they and Kāti Māmoe fought Ngāi Tara and Rangitāne in the Wairau Valley. Ngāti Māmoe then ceded the east coast regions north of the Clarence River to Ngāi Tahu. Ngāi Tahu continued to push south, conquering Kaikoura. By the 1730s, Ngāi Tahu had settled in Canterbury, including Banks Peninsula. From there they spread further south and into the West Coast. In 1827-1828 Ngāti Toa under the leadership of Te Rauparaha successfully attacked Ngāi Tahu at Kaikoura. Ngāti Toa then visited Kaiapoi, ostensibly to trade. When they attacked their hosts, the well-prepared Ngāi Tahu killed all the leading Ngāti Toa chiefs except Te Rauparaha. Te Rauparaha returned to his Kapiti Island stronghold. In November 1830 Te Rauparaha persuaded Captain John Stewart of the brig Elizabeth to carry him and his warriors in secret to Akaroa, where by subterfuge they captured the leading Ngāi Tahu chief, Te Maiharanui, and his wife and daughter. After destroying Te Maiharanui's village they took their captives to Kapiti and killed them. John Stewart, though arrested and sent to trial in Sydney as an accomplice to murder, nevertheless escaped conviction. In the summer of 1831–1832 Te Rauparaha attacked the Kaiapoi pā (fortified village). After a three-month siege, a fire in the p&#257; allowed Ngāti Toa to overcome it. They then attacked Ngāi Tahu on Banks Peninsula and took the pā at Onawe. In 1832-33 Ngāi Tahu retaliated under the leadership of Tuhawaiki and others, attacking Ngāti Toa at Lake Grassmere. Ngāi Tahu prevailed, and killed many Ngāti Toa, although Te Rauparaha again escaped. Fighting continued for a year or so, with Ngāi Tahu maintaining the upper hand. Ngāti Toa never again made a major incursion into Ngāi Tahu territory. By 1839 Ngāi Tahu and Ngāti Toa established peace and Te Rauparaha released the Ngāi Tahu captives he held. Formal marriages between the leading families in the two tribes sealed the peace. On 17 June 1843, Māori natives and the British settlers clashed at Wairau in what became known as the Wairau Affray. Also known as the Wairau Massacre in most older texts, it was the first serious clash of arms between the two parties after the signing of the Treaty of Waitangi and the only one to take place in the South Island. Four Māori died and three were wounded in the incident, while among the Europeans the toll was 22 dead and five wounded. Twelve of the Europeans were shot dead or clubbed to death after surrendering to Māori who were pursuing them. In the 1870s and 1880s, several thousand Chinese men, mostly from the Guangdong province, migrated to New Zealand to work on the South Island goldfields. Although the island has been known as the South Island for many years, the New Zealand Geographic Board has found that, along with the North Island, it has no official name. The board intends to make South Island the island's official name, along with an alternative Māori name. Although several Māori names have been used, Maori Language Commissioner Erima Henare sees Te Wai Pounamu as the most likely choice. This Māori name for the South Island, meaning "The Water(s) of Greenstone", possibly evolved from Te Wāhi Pounamu which means "The Place Of Greenstone". The island is also known as Te Waka a Māui which means "Māui's Canoe". In Māori legend, the South Island existed first, as the boat of Maui, while the North Island was the fish that he caught. In the 19th century, some maps named the South Island as Middle Island or New Munster, and the name South Island or New Leinster was used for today's Stewart Island/Rakiura. In 1907 the Minister for Lands gave instructions to the Land and Survey Department that the name Middle Island was not to be used in future. "South Island will be adhered to in all cases". The South Island takes the definite article when used as a noun whereas maps, headings or tables and adjectival expressions use South Island. This pattern can be found in a number of other names, such as the United Kingdom, the Vatican and the Internet. 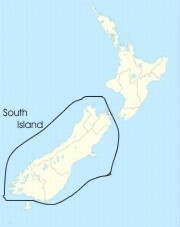 Note also that places are said to be in the South Island rather than on the South Island. This information was correct in June 2009. E. & O.E.